Andrew R. Houghton: What structure are we looking at here? When we perform cardiac MRI studies, we sometimes make incidental findings outside the heart. It's important to comment on these in our reports, but in order to do so we need to recognise what it is that we're seeing. Here's an image from a cardiac MRI study. This was one of the first images we obtained, whilst we were performing some initial views (called HASTE images) of the patient's thorax. 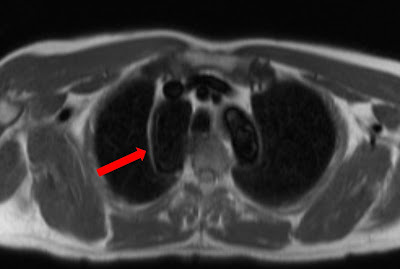 What is the structure indicated by the red arrow? What's the structure indicated by the red arrow? This structure is real (in other words, it's not an artifact). But it's not something we usually see during our cardiac MRI scans. In fact, this is something we see only in around 1% of our scans. It's easy to mistake this appearance for a part of the aortic arch, but in fact it's part of the lung. This is known as an azygous lobe, and it's a congenital abnormality of the right upper lobe. It forms in utero when an anomalous (laterally displaced) azygous vein penetrates the right upper lobe during development, dividing it into two portions. The presence of an azygous lobe doesn't cause any clinical symptoms, and the only real significance is that it can make thoracoscopy more challenging than usual. If you'd like to learn more about cardiac MRI, including how to interpret incidental findings, check out our online Cardiac MRI Essentials course at Medmastery.